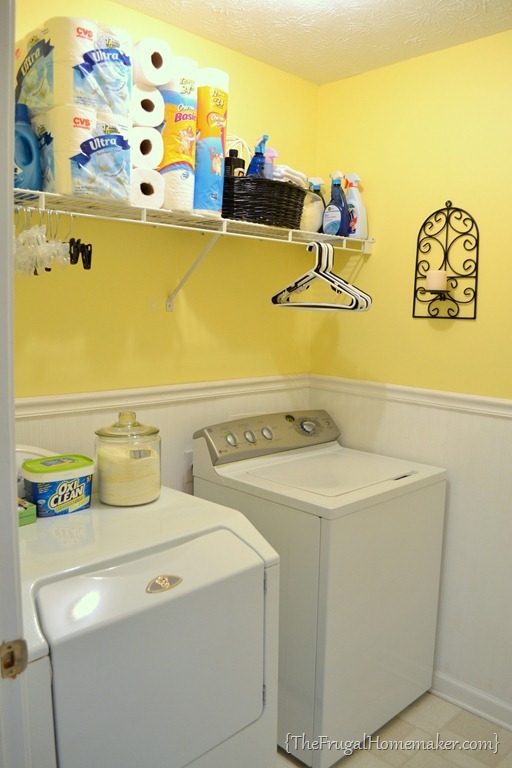 Today let’s take a tour of my laundry room! But before I show you what it looks like today, let’s go back to the beginning. Our laundry room is upstairs in between the 3 bedrooms. LOVE having it up there since most of the dirty laundry (except kitchen towels) are taken off and put away up there. This is pretty much how the room looked when we moved in and put our hand-me-down washer and dryer in it. The wire shelf on the left was already there but we hung the drying rack/wire shelf on the right. It was plain and boring! Then about 3 years ago, we finally bought our first brand new washing machine (we still have a hand-me-down dryer that works just fine.) Before it was delivered, I decided to do a quick makeover of the room. 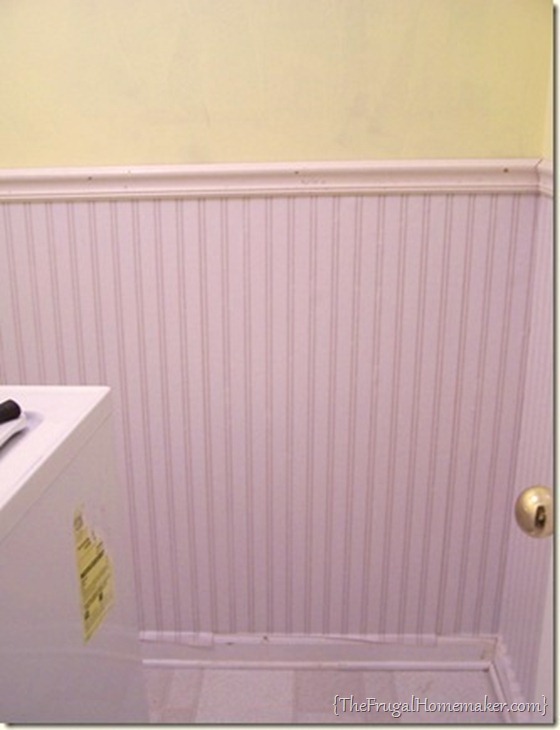 I had picked up some chair rail in a trash pile and I installed it and some clearance beadboard wallpaper and painted it all out white. Then I painted the top 1/2 of the wall with a cheery yellow. Added a few decorations and a new iron “Laundry” hanging rack from Hobby Lobby ($7). 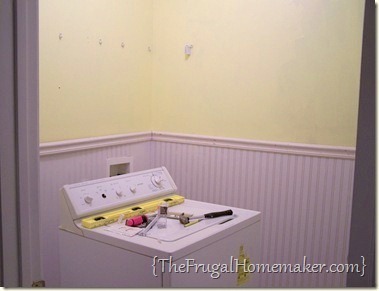 I think this makeover cost like $25-30 including paint, wallpaper, and the new laundry sign. Here’s how the room looks today. 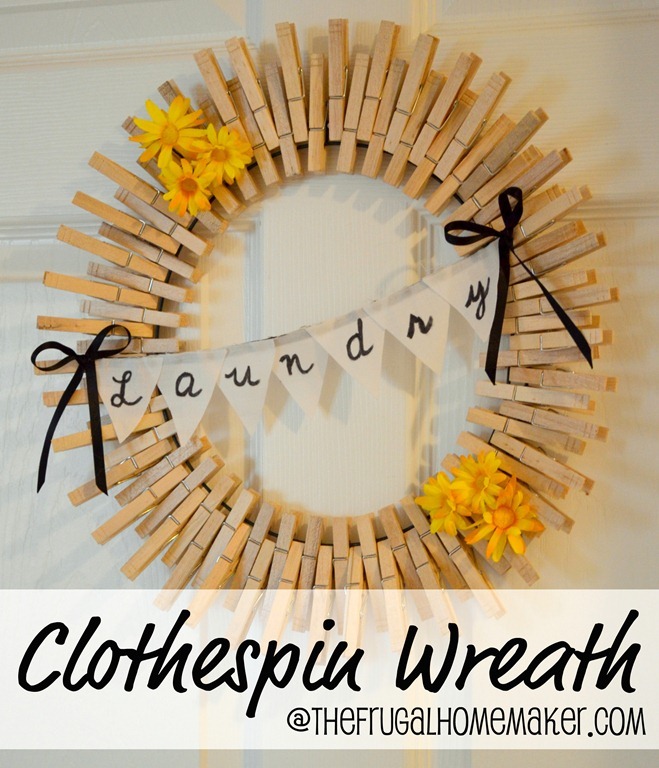 I added my clothespin laundry wreath about a year ago. You can find the tutorial for that wreath here. I Love it! That wire rack on the right I use CONSTANTLY for hanging clothes to dry or to hang clothes up that need to be put away. It is a nice size room. Although I am sure pretty much everyone would love to have a BIGGER laundry room, I am thankful to have an actual room instead of a closet. I have wanted to install cabinets on the wall with the long wire shelf for a long time! In fact my husband and I have been discussing recently whether we should build them or keep looking for some at the Habitat ReStore. 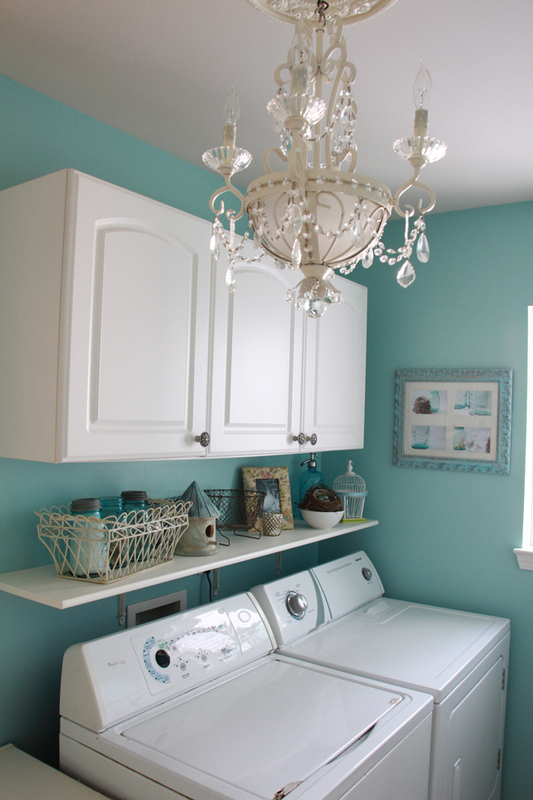 Love this laundry room that Kelly at View Along the Way just did! Her floors, light, cabinets, shelves, that amazing stenciled wall – yep, I pretty much want this whole room! I am not sure if I want to do one cabinet in the middle or 2 cabinets on the side with shelves in the middle – probably the 2 cabinets. And I also may have to find some way to add a hanging bar in there for the extra/empty hangars like in this picture. I also want to build a shelf/box type thing to go in between the washer and dryer to maximize this space. 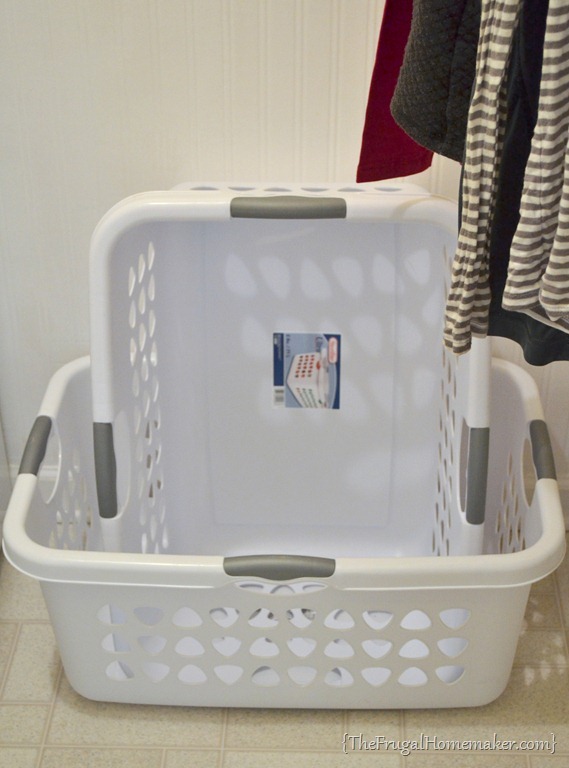 I would love one like this where I could store and sort laundry but my space is not wide enough for a traditional laundry basket to fit. Beckie at Infarrantly Creative adapted this one from Ana White’s plans. 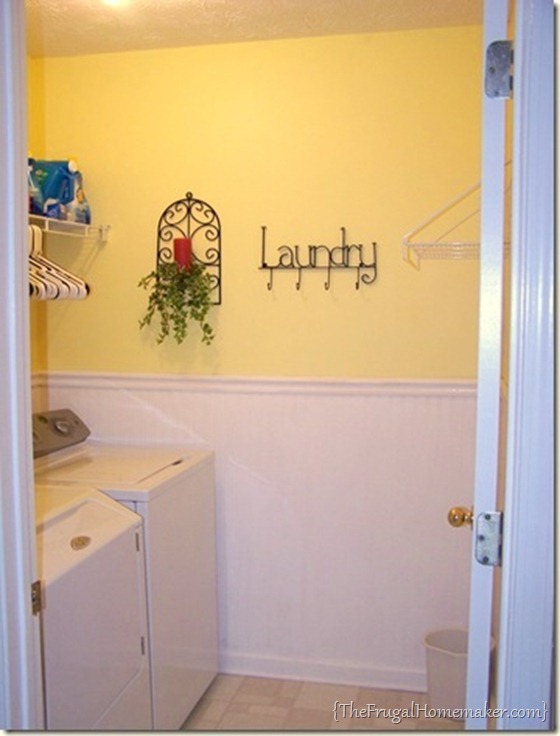 I would have to use smaller laundry baskets or regular baskets. 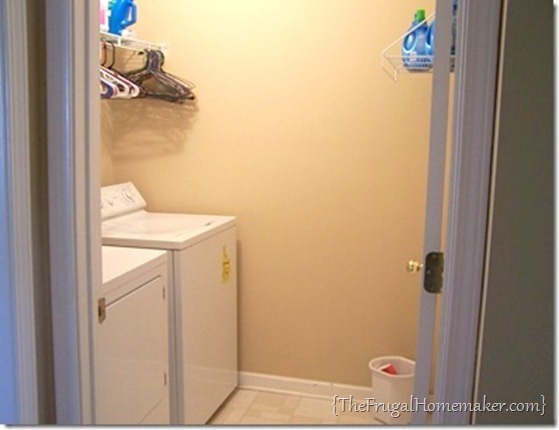 I also love this shelf idea for over the washer and dryer. And while we are talking about her room, I think I may get rid of the yellow and with something in the teal/blue family – maybe a hint lighter than hers. Definitely need to do something to it. I was thinking that I would do the groutable vinyl tiles until I saw Kelly’s amazing painted linoleum floors! And you can’t tell, but that is just a bare light bulb up there. I think we were changing the light bulb one day and dropped the glass cover. I already have fun a Goodwill light fixture that needs to be installed in there that will be MUCH prettier! All of these changes – paint, paint on the floor or groutable tiles, cabinets we would buy secondhand or build ourselves, a shelf, etc. are all very low cost that would make a HUGE difference in this room! I can’t wait to get started! See those laundry baskets – notice something? Yes, they are EMPTY! Every piece of clothing in the house is clean (or on our backs) and there is one load currently drying and it’s not “laundry day” today. This happens EVERY DAY people. It is a laundry miracle and a little secret which I can’t wait to share with you on Friday! Where do you do laundry? In the basement, laundry closet, laundry room, in the garage? Got any inspiration pictures or ideas for me? 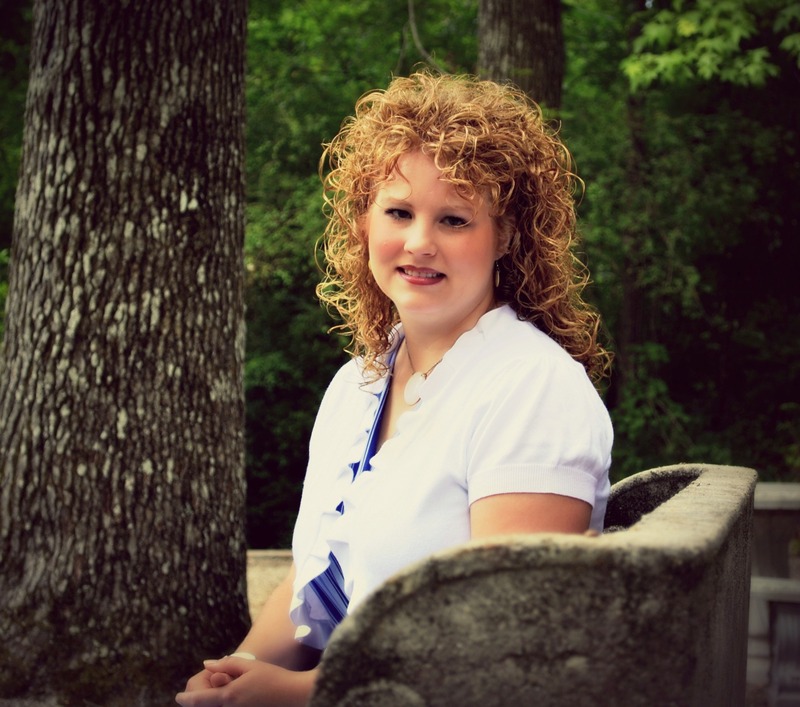 Oooohhhh…love your inspiration pics!!! Can’t wait to see what you decide to do with paint & your floor! 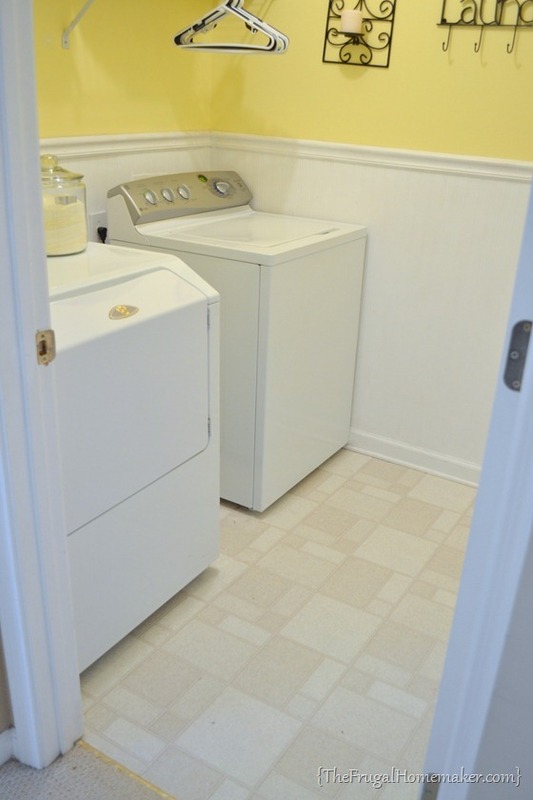 Great job on the Laundry Room! Love your ideas! 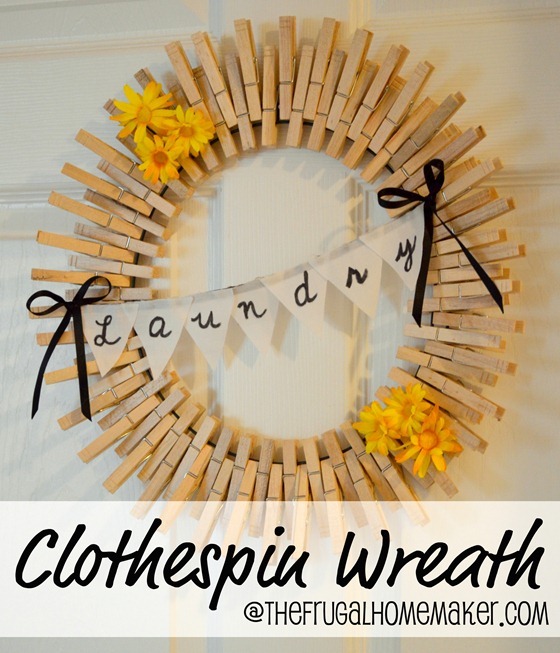 I must have missed that clothespin wreath before – very cute! 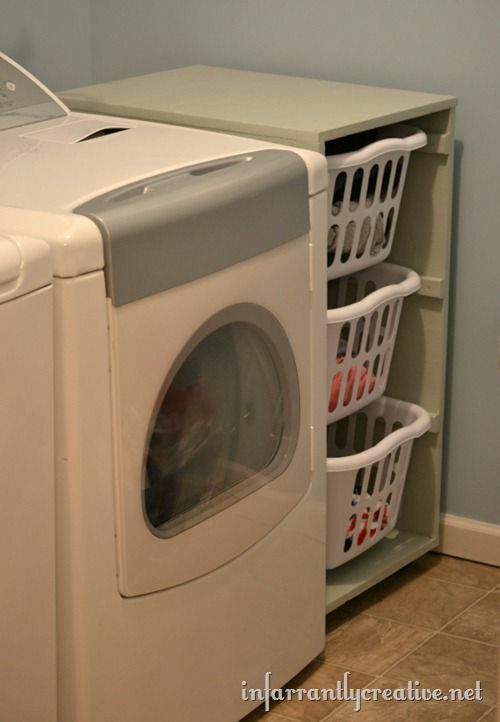 And I think I know your laundry miracle – Leah’s post, right? I do that too and it helps a ton! 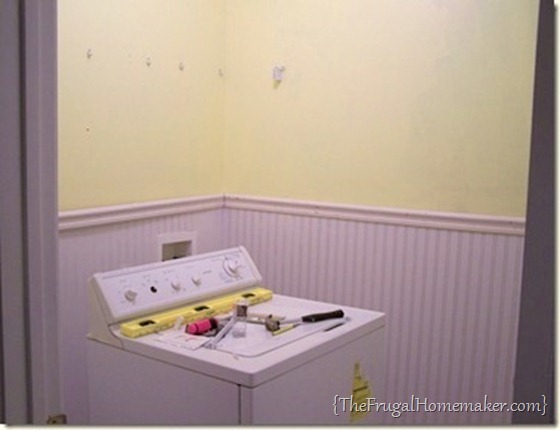 I am actually beginning a redo on my laundry room. Great and timely post! Looking great! I’m so impressed that you got the molding out of a trash pile. Love that! 🙂 Thanks for the link love. 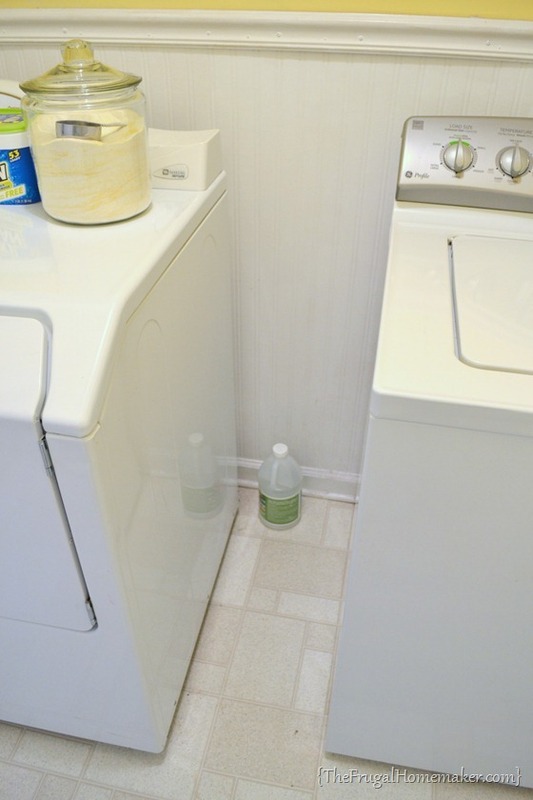 And you have me SO intrigued about this laundry secret!! I can’t wait to hear it! 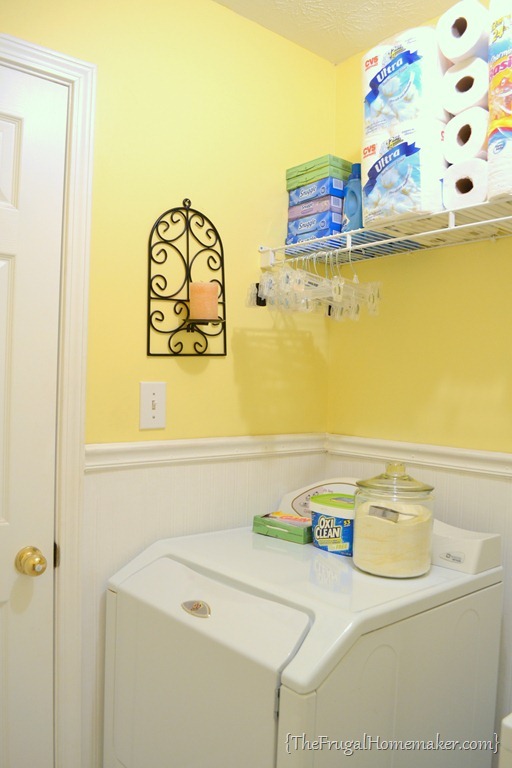 The laundry room is one of those rooms that is so easy to ignore but makes such a difference once you finally pay attention to it. Ours does double duty now as a butler’s pantry. 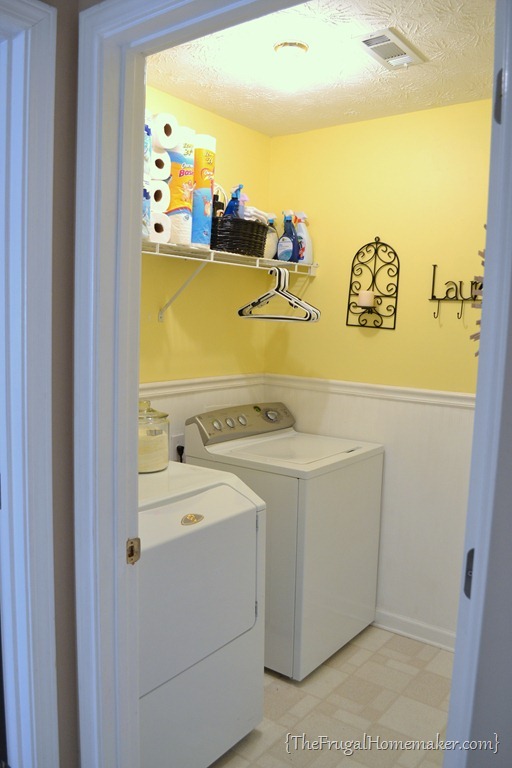 Love the inspiration photo’s you shared – can’t wait to move into our “new” house next month – the laundry room is one of the first places we are going to “fix”! Now a question – is homemade laundry detergent REALLY safe to use in a front loading machine.? I am so afraid that it will mess up my machine and I paid WAY to much for it to “mess” it up. I really need some advice here – I love to save money, but if it messes up my machine and have to have it repaired/replaced I’m not saving am I? Thanks for feedback. You actually showcased a few good ideas in there but I think I fell in love with the iron “Laundry” sign. Simple but it adds so much. 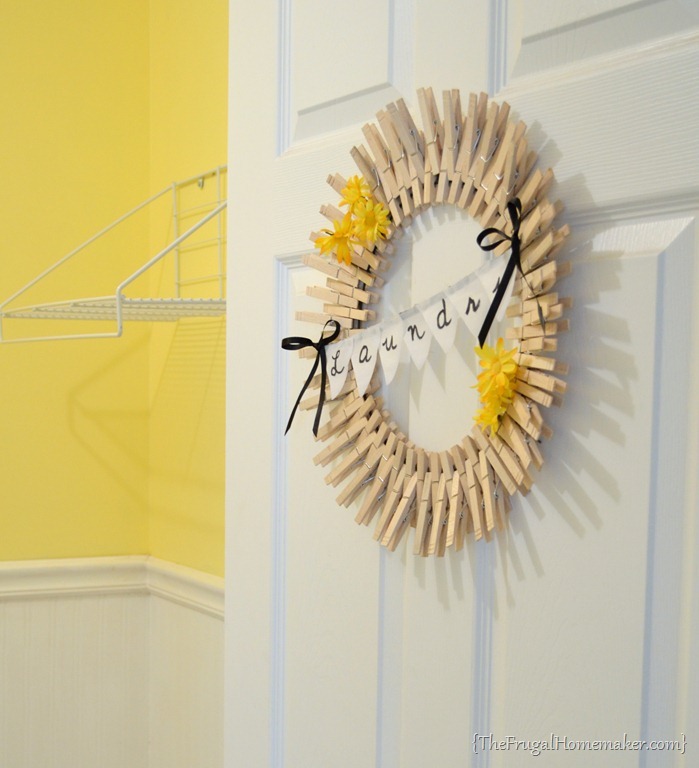 Thanks so much for the clothespin wreath idea Christina! 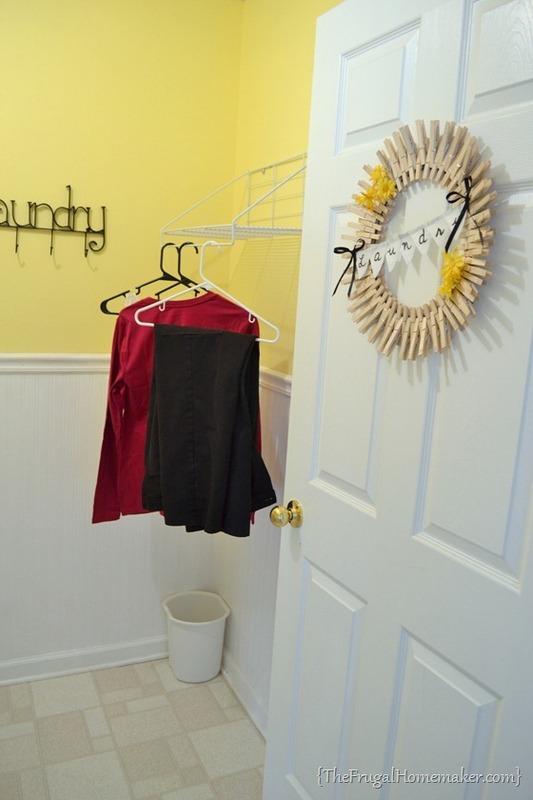 Now I just need to find a wire wreath form to use so that I can make one for my laundry room. So cute!!! 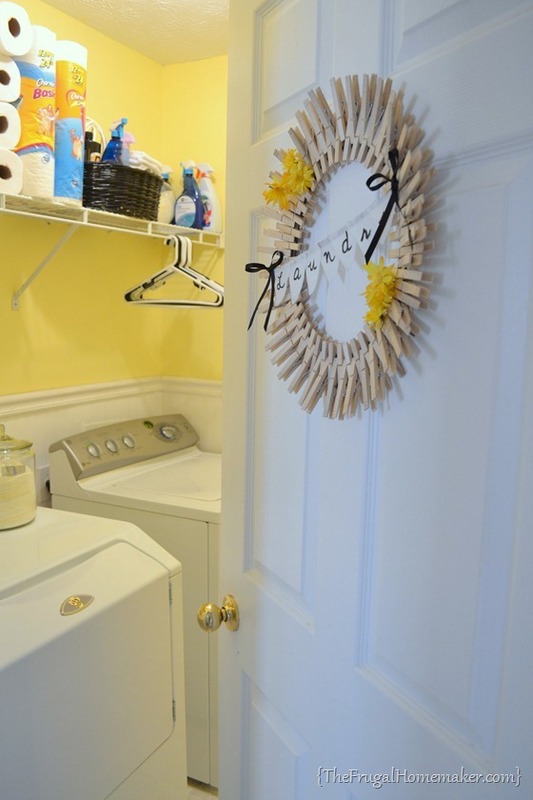 I think you’re well on your way to having the laundry room of your dreams. Such beautiful inspiration. I have some changes I want to make in mine, too. Christina, your laundry room looks BEAUTIFUL!! 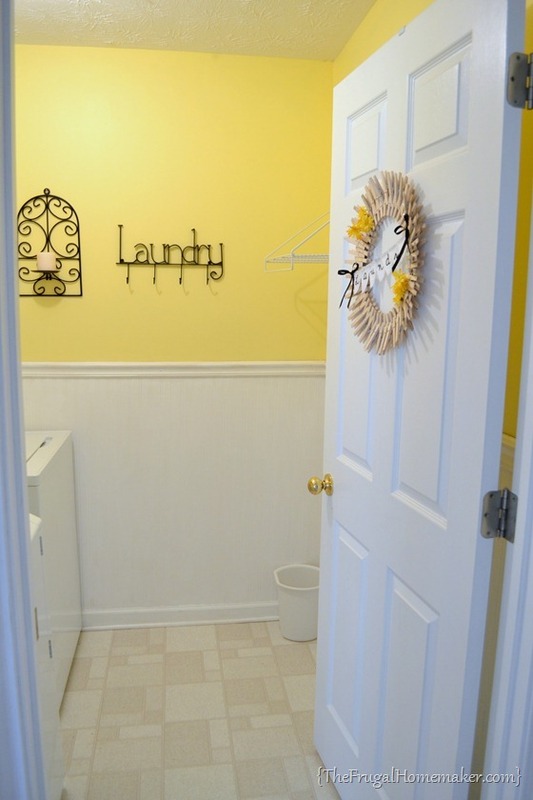 I love that shade of yellow…so bright and cheery, takes the dread out of laundry. 🙂 LOVE your wreath too.